I recently purchased this "vintage' Lilly Pulitzer skirt from a thrift store and it has become one of my favorite spring clothing items. When I posted about this skirt on Instagram everyone went crazy so I thought it would be fun to share a couple of ways I have styled it so far. Look One// I styled this skirt with a plain white shirt, a pink Kendra Scott style necklace and a pair of Sam Edelman sandals. It made for a comfy yet still super cute outfit. I wore pearl earrings, a pearl bracelet, and a brown leather Kate Spade Metro watch. Look Two// On prom day I had to wear a button up shirt so I wouldn't mess up my hair when I changed and it was the perfect oppurtunity to where this adorable skirt again. I paired this chambray button up with the Lilly skirt and Jack Rogers as a second way to style this skirt. I wore my KJP anchor bracelet and necklace, my Invicta safari watch and pearl earrings. 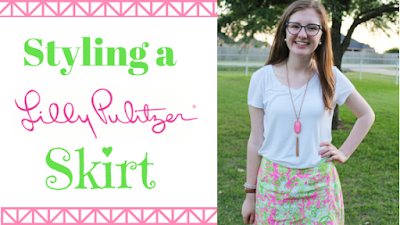 The Lilly Pulitzer logo is not my own and it is owned by the Lilly Pulitzer company. I am not sponsored or affiliated with Lilly Pulitzer in any way. Credit to the owner/ creator of the logo that I included in the header picture. To view source used for the logo picture click here.